Summer is a welcomed time for most families living in the Kansas City community. Long sunny days and warm crisp nights provide us with ample opportunity to indulge in our favorite summer-time activities. However, this also means that your chances of suffering a summer-related injury, such as sunburn or dehydration, may increase. The personal injury team at Caste Law Office wants to remind you to familiarize yourself with common summer-time injuries so that you can avoid paying for unnecessary medical bills this summer. Below are several summer-time health hazards that you may want to watch out for. The majority of the population is susceptible to sunburn when exposed to direct sunlight. Shockingly, many of us do not consider the long-term risks that are associated with sunburn. Long-term risks include the aging of skin, skin cancer, and several other skin conditions. Sunscreen, sunscreen, sunscreen! Applying the appropriate amount of sunscreen to your skin can help protect you from sustaining long-term damage to your skin. Cancer.org reported that UV rays are strongest between 10 am and 4 pm so reapply that sunscreen as often as necessary during that time period. It’s hot, really hot! The National Weather Service reported that 2013 was the last time we had temperatures exceed 100. Thousands of individuals suffer from dehydration during the summer and the recent weather in Kansas City has raised the level of concern in the KC community. Water, water, water! Dehydration can often be prevented by drinking water, replenishing electrolytes, staying indoors and avoiding the heat. 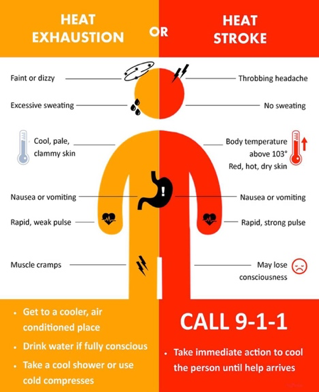 Remember to keep an eye on those who are more susceptible to dehydration, such as children and the elderly. Our attorneys live, work, and raise our families in Kansas City. We are here, right here, fighting for you. If you have been injured in a car accident or at a swimming pool, call us at 816-842-7100 or click here to contact our Castle Law Injury Attorneys.